The sarees are often part of an Indian bride's trousseau. Ralph Fitch (1583–91) describes Banaras as a thriving sector of the cotton textile industry. The earliest mention of the brocade and Zari textiles of Banaras is found in the 19th century. With the migration of silk weavers from Gujarat during the famine of 1603, it is likely that silk brocade weaving started in Banaras in the seventeenth century and developed in excellence during the 18th and 19th century. 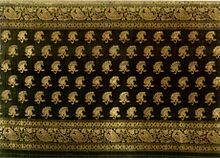 During the Mughal period, around 14th century, weaving of brocades with intricate designs using gold and silver threads became the specialty of Banaras. The traditional Banarasi saree is done with lot of hard work and skillful work using the silk. The saree making is a cottage industry for about 1.2 million people associated directly or indirectly with the hand loom silk industry of the region around Varanasi encompassing Gorakhpur, Chandauli, Bhadohi, Jaunpur and Azamgarh districts. 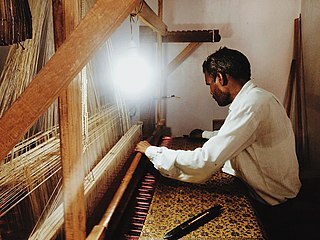 Over the years, the Banarasi silk handloom industry has been incurring huge losses because of competition from mechanised units producing the Baranasi silk sarees at a faster rate and at cheaper cost, another source of competition has been sarees made of cheaper synthetic alternatives to silk. In 2009, after two years of wait, weaver associations in Uttar Pradesh, secured Geographical Indication (GI) rights for the ‘Banaras Brocades and Sarees’. GI is an intellectual property right, which identifies a good as originating in a certain region where a given quality, reputation or other characteristic of the product is essentially attributable to its geographical origin. As per the GI certificate, Banarasi products fall under four classes (23–26), namely silk brocades, textile goods, silk saree, dress material and silk embroidery. Most importantly this means that no saree or brocade made outside the six identified districts of Uttar Pradesh, that is Varanasi, Mirzapur, Chandauli, Bhadohi, Jaunpur and Azamgarh districts, can be legally sold under the name of Banaras saree and brocade. Prior to this, in July 2007, nine organisations, Banaras Bunkar Samiti, Human Welfare Association (HWA), joint director industries (eastern zone), director of handlooms and textiles Uttar Pradesh Handloom Fabrics Marketing Cooperative Federation, Eastern UP Exporters Association (EUPEA), Banarasi Vastra Udyog Sangh, Banaras Hath Kargha Vikas Samiti and Adarsh Silk Bunkar Sahkari Samiti, had applied to the Chennai-based Geographical Indication Registry of Government of India, in a move that was supported by United Nations Conference on Trade and Development (UNCTAD). The increasingly errant and erratic electric power supply, which leads to the electric powered looms sitting idle for greater parts of the day, has made it difficult for the weavers to complete the saris in short time; consequently their earnings are affected. Also, increasing quantities of look-alike Banarasi sarees are flooding the market. These saris are mass-produced in China on massive looms and therefore retail at very low prices. ^ "Different Types of Sarees from North India, South India and East India". Indiamarks. Retrieved 22 March 2016. ^ Saree saga: Draped for elegance, growth too The Economic Times, 5 Apr 2009. ^ The religious route The Times of India, 3 April 2003. ^ "Banarasi Sari – Banarasi Saree, Banarsi Silk Sarees India". lifestyle.iloveindia.com. Retrieved 22 March 2016. ^ The rise and fall of Benarasi silk trade Rediff.com, Geetanjal Krishna in Benares, 21 April 2007. ^ "Types and Brief History of Chanderi Sarees". Fashion Trends. fashionbuzzer.com. Retrieved 22 March 2016. ^ a b Banarasi silk sarees get copyright cover The Times of India, Binay Singh, TNN 18 September 2009. ^ Varanasi weavers, prisoners of faith Times of India, MAHESH DAGA, TNN 8 February 2002. ^ Banaras saris and brocades get GI status Mint (newspaper), 17 September 2009. ^ UNCTAD to support geographical indication registration of Banarasi silk The Economic Times, 19 Aug 2008. ^ Now, Benarasi sarees will be made of natural colours Indian Express, Anuraag-Singh, 19 November 2007. Banaras brocades, by Anand Krishna, Vijay Krishna, All India Handicrafts Board. Ed. Ajit Mookerjee. Crafts Museum, 1966. Wikimedia Commons has media related to Banarasi Sari. Banarasi saree and Brocades at Varanasi Official website.